Gamification Blog Book Tour Underway! See below for the entire list of tour stops! The blog book tour has started as ASTD and I kick-off a 25 stop blog book tour for the ASTD co-published book The Gamification of Learning and Instruction: Game-based Methods and Strategies for Training and Education. The book is available at the ASTD Book Store. The tour includes stops at several ASTD chapter web sites including Philadelphia, New York and Houston, Texas. You are welcome to join the tour, no...you are urged and encouraged to join the tour. Leave a comment on this posting linking to your blog and it will "officially" become part of the tour. The tour currently includes some well known bloggers and some bloggers you really need to know but we want to expand it with your input, ideas and concepts related to Gamification. Here are all the tour stop dates. The blog book tour is a virtual tour so you can just follow along stop by stop. If you don't have the book yet, stop by the ASTD book store a pick up a copy. There is a Pinterest page for the tour. Here are the tour stops, the day of the stop and a link to the stop are indicated below. You can follow along by going blog to blog and leaving a comment. 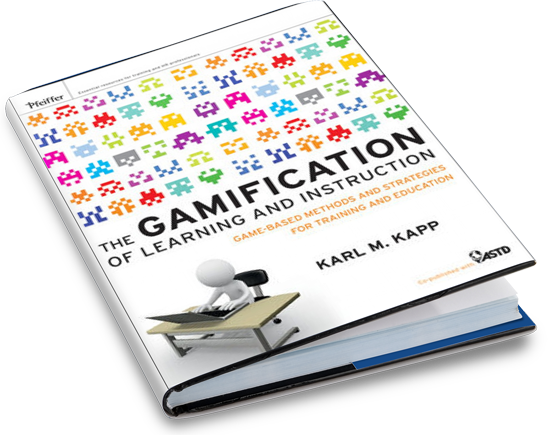 If you stop at every stop and leave a comment, you will receive a free whitepaper "The First Five Steps to Gamification of Content, Curriculum and Courses." Also, on April 26th, Join Karl at the Houston ASTD Chapter's Webinar for a live chat and presentation by the author. Oops, already had a change in venue as my scheduling abilities appear to have been less than stellar, please see below for today's stop. April 16: Learning Circuits Blog. April 20: Rich Mesch Performance Punctuated and he will be joined by Judy Unrein OneHundred Forty Words . April 25: Webinar Presentation for Houston ASTD Chapter "What Research Tells Us about Games, Gamification and Learning" Join the webinar. April 26: Debbie Richards Take an e-Learning Break And a live appearance by Karl at the NY ASTD Chapters combined SIG Meeting. If you are in NY, you may want to register and attend. April 27L Connie Malamed The eLearning Coach. April 30: Amy Lui Abel New York ASTD Chapter Blog. May 4: "Surprise Blog Appearance"
May 18: Karl Kapp Kapp Notes. The author provides reflections and lessons learned from the tour. So join us for this exciting tour and social media event to discuss the pros and cons of Gamification and what it means to learning and development professionals. And follow us on Twitter at #gamiLI.
" You can follow along by going blog to blog and leaving a comment. If you stop at every stop and leave a comment, you will receive a free whitepaper "The First Five Steps to Gamification of Content, Curriculum and Courses." I may be the only one who feels this way, but this kind of if/then extrinsic/external "comment for reward" manipulation is even more disturbing than when used for pure marketing purposes. But using it to essentially withhold knowledge from your own professional community unless/until they leave a comment is actually offensive. This technique puts you squarely in the space occupied by those who've tarnished the word "gamification". I hope you rethink this, in light of a serious pile of evidence that suggests a pure if/then extrinsic reward for a behavior that unambiguously needs to be intrinsically motivating is undermining that motivation. That your audience is all smart, savvy, brain aware people makes no difference because -- as all the recent neuroscience tells us -- that knowledge does not protect one from the damaging effects. The negative undermining effects all happen at a level of conscious processing for which we lack the "security clearance" to access let alone override. I am most disappointed by the fact that you've involved so many stellar professionals in a COMMENT TO WIN bribery scheme. Again, I realize that nobody leaving a comment (or reading one) would *perceive* that they've been manipulated into doing it or that their intrinsic motivation to do so has in any way been compromised. That is the whole point about neuroscience and research -- to help shine a light into areas where what we consciously THINK and what is actually true are different. I thank you for the comment and want you to know that I have acknowledged your thinking and concerns in the book. I actually mentioned you in the Acknowledgements section. Your concerns about gamification are real and need to be seriously addressed which I did in the book's discussion of extrinsic motivation (like striving for certification or earning a badge) versus intrinsic motivation (wanting to learn something for the sake of learning). So thank you for your continued comments and commitment to helping people understand motivation, I am in agreement on that.